The endocannabinoid system impacts pain and inflammation with potential for therapeutic effect on patients with rheumatic diseases. The current treatment options include the herbal product derived from the plant Cannabis sativa, as well as pharmaceutical preparations. The legalization of medicinal cannabis (marijuana) in many jurisdictions and widespread public advocacy has propelled an interest in use either by prescription or self-medication. In this review, we examine current evidence for efficacy and adverse effects of any cannabinoid product in rheumatic conditions. 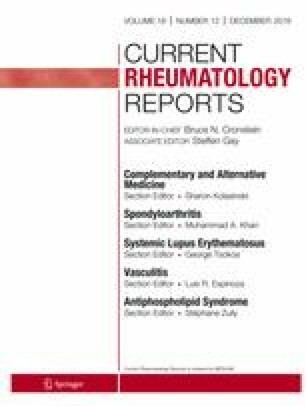 The evidence to date is scant and precludes making recommendations for the use of cannabinoid preparations in rheumatology patients. In particular, the risks of herbal cannabis in patients are not well defined. Anecdote and advocacy cannot supersede sound evidence. All reported studies/experiments with human or animal subjects performed by the authors have been previously published and were in compliance with all applicable ethical standards (including the Helsinki declaration and its amendments, institutional/national research committee standards, and international/national/institutional guidelines).